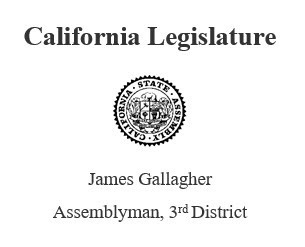 SACRAMENTO – Assemblyman James Gallagher (R-Yuba City) has introduced legislation to ensure that areas affected by the Camp Fire can continue operations as the recovery process begins. The Camp Fire, which started in Butte County in early November, is the deadliest and most destructive fire in California state history. The fire has destroyed more than 18,000 structures and killed at least 88 people. It decimated the communities of Paradise, Concow, and Magalia. Gallagher’s legislation will help fund emergency response and local government operations as the long road to recovery begins. “We have never seen anything like this. The town of Paradise is gone, but the community remains. We will rebuild, and right now the priority is helping those impacted by the fire. This is a marathon, not a sprint,” said Assemblyman Gallagher. “The people of the North State and our regional economy are devastated by one of the worst disasters in our nation’s history. It is imperative that the State of California tap into its nearly $15 billion surplus to help in the recovery of our community,” added Senator Nielsen, who is co-authoring the proposals. Gallagher introduced two bills. AB 41 will provide more state funding for activities like debris removal, emergency work, and repair of public facilities damaged by the fire. Gallagher’s other bill, AB 42, will help backfill revenues that will be lost as destroyed properties get reassessed. “Our communities already had limited resources before the fire. This funding is critical to continue operations as we help people rebuild. We must ensure that we have sufficient funding for emergency response activities and to restore critical services and government functions like education,” said Butte County Supervisor Bill Connelly who represents the communities of Concow, Cherokee and Yankee Hill. In Paradise, the fire destroyed about 95% of homes and businesses. 50,000 people are displaced from the town and surrounding communities. In addition to fiscal challenges, finding suitable housing to help keep people in the area will be a huge challenge in a state that already faces a housing crisis. Gallagher will also be working with stakeholders to provide regulatory relief and streamlining to increase access to interim housing. “The people of Butte County have been devastated by the worst fire in State history. As a State we need to do everything in our power to get all the financial resources we can in order to put these communities and their residents back on their feet,” said co-author Assemblyman Brian Dahle.